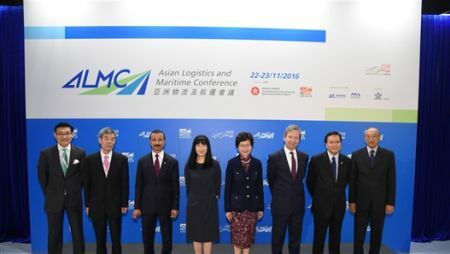 The sixth Asian Logistics and Maritime Conference (ALMC) today (22 November) launched its two-day run at the Hong Kong Convention and Exhibition Centre. More than 70 leaders from the logistics and maritime industries are speaking at the conference. Today’s activities included the plenary session “China’s Grand Initiatives: Where are the Opportunities?” The ALMC is the largest event of its kind in Asia, welcoming industry elites from some 30 countries and regions. The conference is jointly organised by the Hong Kong Trade Development Council (HKTDC) and the Government of the Hong Kong Special Administrative Region (HKSAR). A highlight of this year’s ALMC was this morning’s plenary session “China’s Grand Initiatives: Where are the Opportunities?” Three high-profile speakers examined key strategies of the Chinese mainland – the Belt and Road Initiative, “Internet Plus” and “Made in China 2025”. The three speakers were HE Sultan Ahmed Bin Sulayem, Group Chairman and Chief Executive Officer, DP World; Zhao Huxiang, Vice Chairman, China Merchants Group; and Joseph Phi, President, LF Logistics. Addressing various topics, seven forums were also held today focusing on the Supply-chain Management, Logistics, Air Freight and Shipping sectors. As well as helping the logistics industry analyse the latest market trends, the forums also shed light on how the manufacturing and trading industries can capitalise on the latest logistics solutions to grow their business, lower costs and increase competitiveness. The first Supply-chain Management & Logistics Forum “Relocating Your Manufacturing Base – the Pros and Cons”, heard from speakers about the risks and opportunities from a supply-chain management perspective. Speakers included Dr Qu Jian, Vice President, China Development Institute; Dr John Cheh, Vice Chairman and CEO, Esquel Group; Takeshi Kondo, General Director, Yusen Logistics (Vietnam) Co, Ltd; and Tommy Lui, Director & Group Chief Representative – Southern China, Li & Fung Development (China) Ltd.
Other forums today included “Changing Landscape of Asian Air Cargo”, “Expert Panel: What’s on the Horizon for Liner Shipping?”, “Staying Ahead in Temperature-controlled Cargo Handling”, “Expert Panel: Tanker and Gas Trade Outlook”, “Sustainability – Greening the Supply Chain” and “Expert Panel: Dry Bulk Market Outlook”. Tomorrow’s plenary session will be on the topic of “Cross-border E-commerce: Who Will Rule the Game?” The HKTDC has invited Dr Guo Dongbai, CTO, AliExpress; Zheng Changqing, Senior Director, eBay Inc; Andrey Zatsepin, Head of International Logistics, Ozon.ru; and Haruko Takachi, CEO, Japan Post International Logistics Co, Ltd. to discuss the latest developments in cross-border e-commerce. The rapid development of digital technology is disrupting the retail industry, prompting the HKTDC to enrich this year’s ALMC programme for supply chain management and logistics. Tomorrow’s forums include “Omni-channel Strategy: Navigating the Future of Retail”, which will showcase outstanding examples of multi-channel retailing and examine online-to-offline (O2O) integration and ways to improve the customer experience. Expert speakers include Pieter Paul Wittgen, Co-Founder and COO, Grana.com; Filippo Gori, Business Development Director, International Brands, Vip.com; and Malcolm Monteiro, CEO, Asia-Pacific, DHL eCommerce. The trio will discuss the impact of omni-channel retailing on supply chain management and logistics. Other forums tomorrow include “New Opportunities for Modern Logistics Industry in the PRD Region and Zhuhai from the completion of the Hong Kong-Zhuhai-Macau Bridge”, “Big Data, the Cloud and Your Business”, “Dalian Development Area – Core of Liaoning FTA, uprising International Financing, Logistics and Shipping Centre of Northeast Asia” and “Linking North America and Asia: Transpacific Trade back on Track”. To help industry professionals gather the latest market intelligence and services, and promote Hong Kong’s advantages in logistics, the HKTDC is once again organising an exhibition alongside the conference. Nearly 100 exhibitors are showcasing their e-logistics solutions and logistics, maritime and related services. The HKTDC is also arranging more than 150 one-on-one business matching sessions to help participants foster new business partnerships. This year’s ALMC is supported by the Hong Kong Logistics Development Council (LOGSCOUNCIL) and the Hong Kong Maritime and Port Board. It is also a flagship event of the Hong Kong Maritime Industry Week.